TheRiverKwai.Com - River Kwai Hotels, River Kwai Holiday Villas, River Kwai Self Catering, River Kwai Accommodation. River Kwai has a large selection of accommodation available, with many budget options available for backpackers. Self catering holidays are often a popular choice, although there is also a selection of Hotels to choose from. 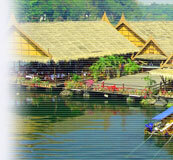 On TheRiverKwai.Com, you'll find a selection of graded Hotels, Self Catering apartments and Guest Houses. Know which hotel you'd like to stay in? Select from the list below. Are you looking for self catering? Select from the list below.